On April 5th at about 12:01 pm, Officers received a call along East Baker Street and Wild Rose Lane regarding an individual who had been assaulted. The victim stated an individual punched, choked, and attempted to stab him with a screwdriver. An Officer recognized the suspect, matching the description given by the victim, from a previous call earlier in the day. The Winters Police Department reached out to neighboring agencies to advise them of the situation and obtained a warrant for the arrest of the suspect. The suspect was identified as Matthew Alexandere Flores, 23, of Vacaville. Flores was arrested by the Solano County Sheriff Office on charges of assault with a deadly weapon, assault causing great bodily injury, retaliation against a witness, and attempted murder. Flores was booked at the Solano County Jail for incarceration. 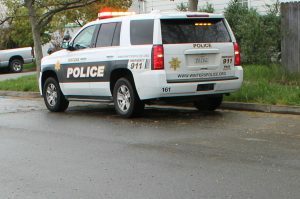 Patrol Vehicle at crime scene of an assault call. Follow us on Social media (Facebook, Instagram, or Twitter) for tips, alerts, and information. Register your email, cell phone, or both with Yolo Alerts to receive emergency alerts for the Winters area. ©2019 Winters Police Department - all rights reserved.